Ecurie Ecosse / Nielsen Racing scored a breakthrough win today in the Michelin Le Mans Cup at Spa-Francorchamps, the #79 Ligier JS P3 of Alasdair McCaig and Colin Noble crossing the line first, leading a 1-2 finish for the team, ahead of the #2 Ligier driven by Tony Wells and James Littlejohn. In what was a roller-coaster race for the team, in tricky conditions, none of the team’s drivers, nor the crew behind the scenes made any key mistakes. McCaig drove the #79 and Wells was aboard the #2 at the start of the race, which began in greasy conditions. Wells struggled on cold tyres on the first lap and slipped back a handful of places after running wide at La Source, allowing McCaig to storm through and battle in the podium spots from fourth on the grid. McCaig briefly took the lead, but with the amount of rainfall becoming increasingly intense, the Scot decided to consolidate his position at the head of the field, letting the pro’s behind past ensuring that Noble would receive the car intact and in the best possible position to win. Before handing the car over during the mandatory stop, McCaig pitted the car to put on wet tyres. This made navigating the drenched circuit far easier for McCaig, who then pitted a second time halfway through the race in third, ahead of Wells who climbed back up the order to fourth. Noble emerged from the pits, a minute and forty seconds behind the leading car, in third. In similar fashion to his performance at the Red Bull Ring earlier in the summer, Noble proceeded to reel in the two cars ahead, at on average five seconds a lap with the rain still coming down hard. He reduced the deficit lap by lap, and got within nine seconds of the leader with just 10 minutes remaining having made a move for second halfway through his stint up the inside at Pouhon. The leader then lost control of his car on the exit of Pouhon and ended up stranded in the outside tyre wall. That allowed both Noble and Littlejohn (then aboard the #2) through into first and second, where they would finish after cruising to the line. For the team, it’s the first Le Mans Cup victory of the season, and third podium finish in a row for the #79 crew. 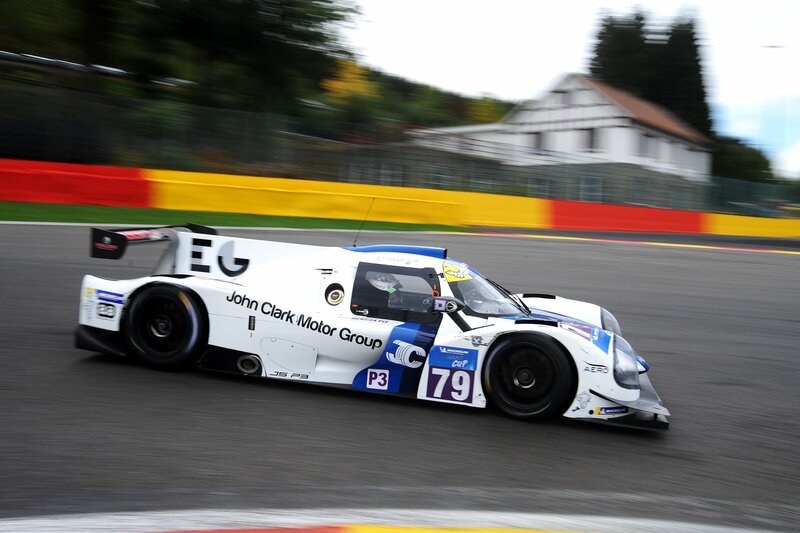 It’s Noble’s second win at Spa this year, after he won an LMP3 Cup race with Ecurie Ecosse earlier this year, and McCaig’s third victory in seven days, after he took two wins last weekend in the Classic Spa 6 Hours event. The team will be back in action tomorrow, in the ELMS 4 Hours of Spa, which will start earlier than originally planned at 10:45am, due to adverse weather. Alasdair McCaig: “The conditions were pretty tricky, but we got a good start. Tony and Mikey Benham went straight on so it was quite easy for me. Then the rain came down and we had to come in for wets, we probably pitted a lap later than we should have, which made it harder for us. Colin Noble: “I’m really happy with that, in tricky conditions. Alasdair probably had a harder time driving on slicks in the wet. The team did great in the stops and we managed to come home first. I could see the leader when he went off and the team told me immediately that he was in the tyres. So that meant the last few laps I could run with the pressure off.